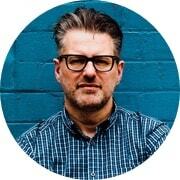 Although writing a book might appear to be a lonely occupation, in reality it’s a team effort. 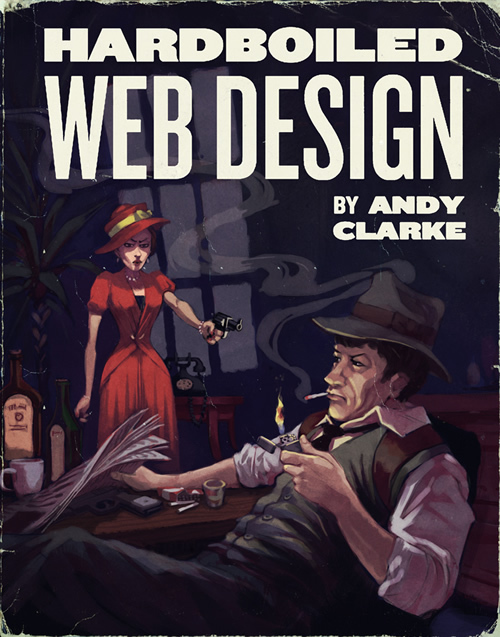 For Hardboiled Web Design I’ve been lucky to work some incredible talent, including cover artist, the one and only Kevin Cornell. 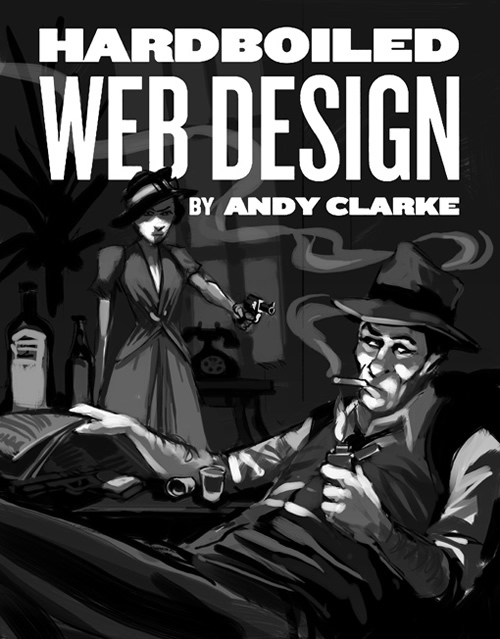 When Mark and I started talking about the design of Hardboiled Web Design, there was one name that was on both our lips to illustrate the cover — Kevin Cornell. If you’ve read A List Apart, you’ll be familiar with Kevin’s work and I’ve worked with him before on an illustration for the home page of Stuff and Nonsense. 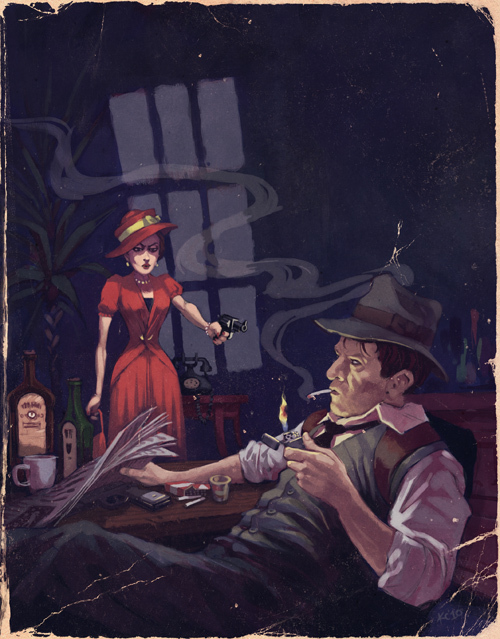 We were delighted when Kevin agreed to work on the cover and we gave him a loose, open brief — to evoke the mood of the pulp classics I love without copying it. I’ve never seen Kevin work in that style, so when he delivered the first sketches a few weeks later, my jaw dropped through the floor! Mark and I loved both concept, but we preferred the implied narrative of the first and asked Kevin to carry on developing that. 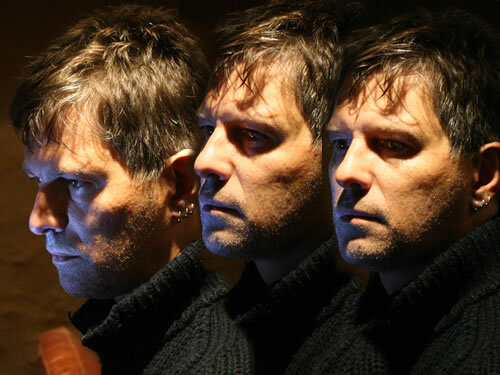 Call me vain, call me a diva (it’s been said before), but I wanted the detective to look a little more like me, without it becoming a portrait. So I sent Kevin a few reference photos. Then Kevin delivered the cover’s final artwork and I actually became quite emotional. The cover was better than I could ever have hoped for or imagined it would be. 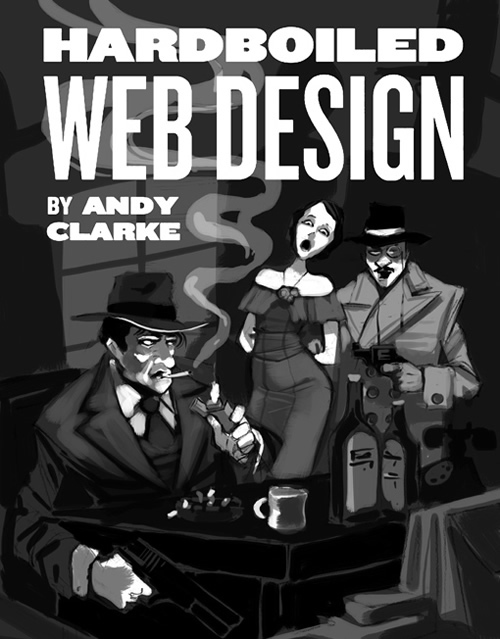 Hardboiled Web Design goes on-sale later today, from Five Simple Steps, at 16:00 BST, 11:00 EST and 08:00 PST. It will be available in PDF format and paperback and a limited edition PDF/paperback bundle that includes an A2 poster of Kevin’s cover artwork. Buy quickly as there are only 2500 of the PDF/paperback/poster bundle available. I’m finding it hard to believe, but after seven months in the making — it’s almost time to get hardboiled.